Below you can view all the homes for sale in the Silverado Courtyards subdivision located in Las Vegas Nevada. 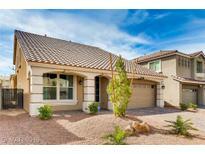 Listings in Silverado Courtyards are updated daily from data we receive from the Las Vegas multiple listing service. To learn more about any of these homes or to receive custom notifications when a new property is listed for sale in Silverado Courtyards, give us a call at 702-323-5939. House is secured by Rolladen shutters. MLS#2088032. World Capital Realty. Kitchen has lots of cabinet space,granite as well ,under mount sinks ,pre wired for ceiling fans ,upgraded appliance package ,surround system,alarm system outside features paver stone driveway a great home ! ! MLS#2084460. Elite Realty. Custom staircasing, Wet Bar, Upgraded kitchen with granite countertops, kitchen island, sunken formal dining room, open loft, master suite w/ his & her closets, separate shower/tub, huge backyard w/ custom landscaping for all your entertaining needs, Tesla integrated solar energy system. MLS#2084702. Huntington & Ellis, A Real Est. Monthly HOA fee includes your water bill & frontyard landscaping! MLS#2080829. Province Real Estate. Park area is located in the community and extra parking throughout. Welcome home! MLS#2082856. Urban Nest Realty. Owner has only occupied home since December 2018. Still smells new! MLS#2081957. Executive Realty Services. Don't miss out on this award winning builder, sought after floor plan, and sparkling pool just in time for some summer entertaining! MLS#2079843. Keller N Jadd. Reverse Osmosis, Tankless Water Heater, Water Softener, Sparkling Salt Water Pool Has Variable Speed Pump, Alarm/Nest/Ring/Wap Outdoor Floodlight Cameras All Included! MLS#2079885. NextHome Integrity. 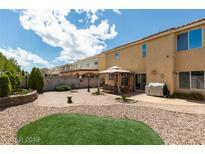 Home has lots of light, Pool size yard. MLS#2077751. Realty ONE Group, Inc.
Home Is Right By The Park And Grass Area! MLS#2078226. Innovative Real Estate Strateg. Master Bedroom W/ Walk-in Closet, Upstairs Computer Niche, Ceiling Fans More! Extra Large Lot! MLS#2066724. Paradigm Realty. Meticulous owner makes for a move-in ready home. MLS#2055621. Realty ONE Group, Inc.
Great 2 Story Home In Gated Silverado Ranch Community, Low Maintenance Landscaping Near Schools, Shopping And More! MLS#2057943. Re/Max Titans. a Must See!!! Thank you for your interest! MLS#2043912. Coldwell Banker Premier. Beautiful Two Story Home In A Well Maintained Gated Community * Property In Great Shape * Three Large Bedrooms And Laundry Upstairs * Very Open Living Area Downstairs With Lots Of Natural Light * Fireplace, Vaulted Ceilings, Sunscreens, Fans And More Upgrades * All Appliances Included, And Some Furniture * Nice Patio With Garden Area And Dog Run * Pet Friendly Park Right Behind * Traditional Sale, Easy To Show, Call Listing Agent For More Info MLS#2040118. Compass Realty & Management, L.